Canada's history as a country of immigrants has resulted in a nation rich in cultural (and musical) diversity. From the time of the earliest settlements in Canada to the present day, immigrants have brought their own music to Canada. Transplanted and cultivated in the new land, these musical traditions have developed a new life, often evolving into distinctive Canadian styles. Musical performances have served a number of important roles within immigrant communities: affirming community solidarity, asserting and reaffirming cultural identity, providing a connection with the homeland and heritage, and passing cultural knowledge on to the next generation. Instruments that accompanied immigrants to Canada became important and functional objects for individuals, families and communities. The Canadian Museum of Civilization has collected a large number of musical instruments that reflect Canada's history of immigration and the multiple traditions of Canada's varied ethnic diversity. The following will highlight a selection of these instruments, considering their importance in historical and contemporary practices in Canadian immigrant communities. One of the most prevalent musical instruments in Canada from the earliest days of settlement was the violin. Small and portable, this versatile instrument found a home in the musical life of all social strata, from the formal balls of colonial administrators and military officers, to the dances and songs of fur traders, farmers and fishermen. Immigrants from France, Scotland, Ireland, Britain and Germany all brought their own repertoire and playing styles to Canada. The violin became the instrument of choice for dance music in both English and French communities of the 17th and 18th centuries, and it continued to be used in this context in rural settings until the 1960s. "Fiddling" has a continuous history in Canada, and continues to be one of our strongest traditions. This violin [above, right], from Lac St. Charles, Quebec, was made in Canada between 1875 and 1921. In addition to the French Canadian, Scottish, Métis, and Anglo-Canadian styles of fiddling, later immigrants from the Ukraine, Poland, Romania, Hungary and other areas of Europe also brought their own fiddling styles, instruments and traditions to contribute to the mix. One of the most beautifully decorated fiddles in the museum's collection is this Norwegian Hardanger fiddle [left], built in 1928. The Hardanger fiddle is distinguished from the regular violin partly by its decoration, but also by its sympathetic1 strings, added for resonance, that run below the fingerboard. Its repertoire consists of folk songs, dances and bridal marches. Norwegians immigrated in substantial numbers to Canada in the late 19th century, settling on the prairies and in coastal British Columbia. Other instruments used to accompany dance in early Canadian immigrant communities included the harmonica and button accordion. In addition to its importance in French Canadian folk traditions, the button accordion became very popular in Newfoundland, where it was the preferred instrument for dance music. Perhaps the greatest icon of Scottish traditional music culture in Canada, the highland bagpipe came to Canada with the earliest immigrants from Scotland, who settled in Nova Scotia and Upper Canada. As a martial instrument, the highland bagpipe was used in the 18th century in Scottish regiments in Nova Scotia and Quebec. The bagpipe continued to be used as an instrument of war in the 20th century, when pipers rallied troops on the battlefield in both World Wars. This instrument [below] belonged to Pipe Major Sam Scott, a member of the Cameron Highlanders of Ottawa, who played these pipes for Canadian troops in France during World War II. Highland pipe-bands have continued to thrive in Canada with the formation of civilian bands and the establishment of local, national and international pipe-band competitions. 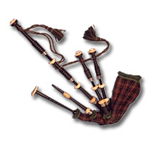 Although bagpipes are strongly associated with Scottish and Irish music here in Canada, they are also present in music cultures of European immigrants from Hungary, Czechoslovakia, Rumania, Yugoslavia and Poland. The Polish bagpipe [above], known as koziol, a bellows-blown instrument from Wielkopolska, was traditionally used to accompany dance. Another example of a European bagpipe is the zampogna, from Southern Italy or Sicily. The zampogna was an outdoor instrument, played on religious holidays and civic celebrations. This example [right] was brought to Canada by Italian immigrant Michele Trozzolo, who settled in Toronto. He subsequently learned how to make similar bagpipes himself, and he has sold his instruments in North America and countries abroad, including Italy. Immigrants from Poland, the Ukraine, Hungary, Italy and other countries in Eastern and Western Europe, and some from Asia as well, began to arrive in large numbers in the late 19th century, bringing many new musical instruments and traditions with them. Ukrainians were the most numerous of the European immigrants who began to settle on the prairies at this time. By World War I, 170,000 Ukrainians had moved to Canada, most of them establishing homesteads in Alberta, Saskatchewan and Manitoba. Today, there are over 1 million people of Ukrainian descent in Canada, making them the 9th largest ethnic group in Canada. Over the years, the many Ukrainian arts councils, dance troupes and community organizations across Canada have contributed to the perpetuation of traditional Ukrainian culture in Canada. The national instrument of the Ukraine is the bandura, a lute with a shallow oval body, a short, fretless neck and many strings (up to 30) running over the neck and across the body of the instrument. The bandura is used to accompany solo or group singing. This example [left] was built in 1962 in Ontario by Mr. Peter Stepowy, who is said to have built over 100 of these instruments. One of the most popular Ukrainian instruments used both as a solo instrument and to accompany song and dance is the tsymbaly (sometimes also spelled cymbaly), a hammered dulcimer. Related forms of this dulcimer with similar names can be found in Romania, Greece, Poland, Hungary, and the Baltic countries. In Hungary, a larger form of this dulcimer, known as the cimbalom, is often played as a solo concert instrument. The example below has 35 courses2 of strings. In addition to the Europeans who settled on the Canadian prairie in the late 19th century, immigrants from Iceland made the area around Lake Winnipeg their home, forming a self-governing colony known as "New Iceland" near Gimli, Manitoba. The Icelandic langspil below was made shortly after 1900 by Benedikt Arason, a farmer who lived south of Gimli. It is a fretted and bowed zither with 2 strings, a softwood rectangular resonator and hardwood scroll. Although largely replaced in practice by the violin, the langspil is valued among Icelandic-Canadians as a symbol of traditional Icelandic culture. A large number of plucked zithers have come to Canada (and to the Museum) from countries around the Baltic Sea. Migration from these areas (Lithuania, Latvia and Estonia, for example) began early in the 20th century, but peaked after World War II, when many of the Balkan states were reabsorbed into the Soviet Union. Plucked zithers are versatile instruments, capable of assuming a solo role or serving to accompany singers and other instrumentalists. Small zithers like these could be transported easily from the homeland, but sometimes they were made by talented craftsmen here in Canada. This beautiful Latvian kokle [above], for instance, is constructed of Canadian maple with a spruce soundboard. It has 13 metal strings and is beautifully carved. In Latvian folklore, the kokle, endowed with magical power, can charm all animals. A related instrument from Lithuania is the kankles. This example [below], made by V. Kulpavicius, has 18 metal strings, and is decorated with floral and geometric designs. Finally, this Estonian kannel [above], with oak frame and plywood soundboard, has 46 strings, and dates from the late 1930s to early 1940s. The wave of immigration to Canada in the late 19th century included some Asians as well as Europeans. Chinese men came as migrant workers, employed first in the gold fields of the Fraser River Valley, then in the construction of the transcontinental railway in the 1880s. Approximately 17,000 Chinese men immigrated to Canada during that time, mostly settling in the Fraser Valley and Cariboo areas of British Columbia. Today, over 1 million people of Chinese origin live in Canada, congregating mostly in large urban centers in Ontario, British Columbia and Alberta. From the earliest days of Chinese settlement in Canada, music played an important social role in Chinese-Canadian communities. In addition to providing much needed entertainment, a link with the homeland, and a context for socialization, many music societies and clubs raised funds for social relief in Canada and China. Cantonese opera, a popular form rather than an elite tradition, became a focus for such activity. By the 1870s, three Cantonese opera societies were already in existence in Victoria, B.C. Opera companies like these continue to thrive today, serving both community events and occasions for multicultural display to the broader non-Asian society. The instrumental ensembles of Cantonese opera include a number of string, percussion and wind instruments. Some of these instruments are shown below. Huqin is a general name for Chinese fiddle. Most huqin have 2 strings and the bow is inserted between the strings. There are many varieties used in genres of Chinese opera, including the gaohu, made of bamboo with a tubular resonator, and the erhu, a larger version made of hardwood, sometimes with a hexagonal or octagonal resonator. Dizi, also known as the di, is a transverse flute made of a single tube of bamboo. Many sizes and varieties exist in China. The yangqin is a hammered dulcimer, adapted from the Middle Eastern santur which was introduced into China at the end of the Ming Dynasty. It is trapezoidal in shape and is played with light bamboo beaters. The yangqin is especially popular in Cantonese ensembles. Gongs and Cymbals are an integral part of all varieties of Chinese opera. Luo are shallow gongs, made of brass or bronze that change pitch when struck. Larger luo descend in pitch while the smaller luo rise in pitch. The cymbals (po) often have a large bowl-shaped boss. The yueqin is a plucked lute with a short neck and circular body made of wood. Its name translates literally as "moon qin" because of its large circular shape. Four strings in two double courses are tuned a fifth apart, and 8 to 12 bamboo frets are glued onto the neck and upper soundboard. This example [above] was brought to Canada in 1900 from China. Cantonese opera performances in Canada and China also frequently employed some Western instruments in the ensembles. The violin and saxophone were two of the most common Western instruments to be used. Japanese immigrants to Canada also began to arrive in the 19th century; by 1900 more than 4,000 Japanese were living in British Columbia, working as labourers, fishermen and farmers. According to the 2001 Canadian census, more than 85,000 people of Japanese descent are now living in Canada, with the largest numbers residing in British Columbia and Ontario. Aside from the very visible tradition of taiko drumming which has gained popularity across the country in recent decades, traditional instruments such as the shakuhachi, koto and shamisen are known, taught and seen in contemporary performances in urban centers across Canada. The shakuhachi is a notched, end-blown flute made of bamboo. It is simply constructed, but difficult to play. In Japan it has been used for different kinds of music, but often is associated with Zen Buddhism because of its use by wandering Buddhist priests (kumoso) in the 18th century. A solo repertoire for use in meditation was developed during this time, and this repertoire continues to be popular today, even though the shakuhachi is no longer considered exclusively (or even primarily) a religious instrument. The koto, a plucked long zither, is another traditional Japanese instrument with a significant profile in Canada. Organizations such as the Koto Ensemble of Greater Vancouver, established in the late 1950s, have marked a resurgence in popularity of traditional Japanese music and culture, particularly on the West coast of Canada. The koto is normally placed on the floor, the performer kneeling in front of the instrument to play it. Its 13 strings are plucked with the right hand, while the left hand presses on strings to alter their pitch. Once an instrument of the elite in Japan, the koto spread into the middle classes beginning in the Tokugawa period, and by the 19th century, it was found in private homes throughout Japan. It is an instrument played by both men and women. South Asians3 comprise the second largest population of Asian immigrants to Canada, eclipsed only by the Chinese. Most came to Canada after the Second World War, when there was a demand for more labour, and discriminatory legislation against Asian immigration was abolished. Today, over 700,000 people of South Asian descent live in Canada with large populations in urban Ontario and British Columbia. South Asians in Canada have maintained their traditions of classical music and dance, establishing schools and performing groups in major cities across the country. A good number of skilled performers of this music reside in Canada, and there are many performances of Hindustani and Karnatik music and dance in major cities across Canada throughout the year. Perhaps the best known instrument from Hindustani (North Indian) music is the sitar. The sitar is a plucked lute with a long neck attached to a hollow gourd which acts as a resonating chamber. There are four melody strings, three drone strings used for rhythm and 12-20 sympathetic strings which are allowed to vibrate freely. Approximately 19 frets are placed along the neck; these are movable and adjustable according to the raga. A related instrument is the vina, commonly found in Karnatik (South Indian) music. The vina, also known as the "Saraswati Vina" is one of the oldest instruments in India. Ancestors of the vina are found in bas reliefs on temples from the 6th and 7th centuries, but it is thought to date back to the time of the Natyasastra (a major treatise on music dated sometime between the 2nd century BCE and the 2nd century CE). The vina is very similar to the sitar, but it does not have sympathetic strings, and it is made entirely of wood. Its 24 frets are set into wax, and it is held semi-horizontally when played. The neck of the instrument shown below ends in a carved dragon's head that has been covered in gold leaf, and the balance gourd, located at the top of the instrument, has been beautifully decorated. One other common solo instrument from Hindustani music culture is the sarod. Unlike the sitar, the sarod is unfretted. The fingerboard is covered with a smooth sheet of metal, and the player slides his or her finger along the smooth surface of the fingerboard to produce the necessary slides and transitions in pitch. This instrument [above] is between 100 and 200 years old and was derived from Afghani rabab. There are four or five metal playing strings, three to five drone and rhythm strings, and 11-16 sympathetic strings. South Asian classical musics normally consist of three components: melody, drone and rhythm. The most common drone instrument, used in both Hindustani and Karnatik musics, is the tambura (also known as the tanpura), a tall, plucked lute, about 3 ½ to 5 feet long. The longest part is its hollow neck which ends in a bowl-shaped large gourd covered with a piece of wood. The tambura has 4 strings tuned to important pitches of the raga. It is held vertically and is strummed continually throughout the performance, providing the drone. The mrdangam is a double headed barrel drum used in Karnatik music. It is made of wood, with tuned, composite drum heads that are used to provide the tala, or rhythmic framework for the music. A similar barrel-shaped drum used in some genres of Hindustani music culture is known as the pakawaj, but the most common percussion instrument in North Indian music is the tabla. The tabla is actually a pair of drums played with the hands (one hand per drum). The higher pitched wooden drum is called the dahina (also daya) and the metal drum which provides the lower pitches is called the baya. The tabla is used for many kinds of music, accompanying vocal and instrumental genres, kathak dance and devotional music as well. In recent years, the tabla has become prominent as a solo instrument and also has been featured in many mixed World Music ensembles. Koreans are more recent arrivals in Canada compared to South Asian, Chinese, or Japanese immigrants. Most Korean immigration occurred in the decades following the Korean War (1950-53). Today approximately 101,000 people of Korean descent live in Canada, and more than half of them are in Ontario. The museum possesses a number of beautifully decorated traditional Korean instruments. Perhaps the most important of these in Korean music culture is the changgo. Similar to the Japanese tzuzumi, the changgo is a double headed hourglass shaped drum, and it is the main percussion instrument of Korean music. The body is hollow, made from a single piece of wood that is usually painted and sometimes also decorated. Its two circular heads are mounted on metal hoops and laced together across the body of the drum. The changgo is usually placed horizontally in front of the player, who is seated. The left head is struck with the performer's open hand and a bamboo stick is used on the right head, resulting in distinct timbres. This drum is used in court and folk genres, and has its own solo repertoire in samullori, a recent ensemble composed entirely of percussion instruments. In the decades since World War II, many immigrants have come to Canada as refugees, fleeing the political upheavals of their own countries. The conflict in Southeast Asia, which reached a crisis in the 1970s, caused many in Vietnam, Cambodia and Laos to leave their homelands to settle in Western countries, including Canada. Between 1979 and 1991, over 140,000 Vietnamese refugees landed in Canada. Over 40% of them settled in Ontario, but large populations can also be found in Quebec, British Columbia and Alberta. One of the main traditional instruments of Vietnam is the dàn dáy, a plucked lute, which is said to be found only in Vietnam. It has a trapezoid-shaped body, three strings, high frets and a very long neck, and is used to accompany singers. Formerly only played by men, the dàn dáy is considered a powerful instrument that was given to humans by the immortals. The second dàn dáy in the museum's collection is an example of the way in which traditional instruments can be adapted to meet new needs in new contexts. In this case, the instrument has been modified by the addition of electric pick-ups to make it more suitable for popular repertoire. Immigration from Arabic countries across the Middle East began in the late 19th century, but has been steady only since the 1960s. Most Arabic immigrants have settled in large urban centers, such as Montreal, Toronto and Ottawa and in these cities community organizations and performing groups often promote traditional music and dance. Two well-known traditional instruments that are found throughout the Middle East are the oud and the darabukka. The oud (also known as "ud") is a short-necked plucked lute, the ancestor of the European lute. Its body is pear shaped, and its rounded back is made from strips or "ribs" of hardwood. The three sound holes on the flat surface of the body often are highly decorative. Five courses of strings are the most common, but other configurations are possible as well. The instrument at left is an "ud arbi" from Tunisia. It has a narrow body and an oak soundboard. The oud is a feature of Tunisian classical music, used in the nouba or suite of instrumental and vocal music. The darabukka is a single headed goblet shaped drum, common to most countries in the Middle East. It is made of wood, metal or pottery, and is usually held on the leg or hip and played with both hands. Traditionally the head is made of animal skin, but today many darabukkas have mylar, or plastic heads, since they are easier to tune and retain their pitch with changes in humidity and temperature. It is used in both classical and popular musics. The instrument below is a ceramic darabukka from Egypt. These stoneware darabukka [above, right] are made here in Canada by Tony Bloom of Canmore, and Martin Breton of Quebec. African immigrants to Canada have been small in number until recent years, when larger waves of immigrants from French-speaking areas of Africa have begun to settle in the province of Quebec. As part of the global "Francophone" culture, musics from these African countries have found a home in Quebec society and are highlighted regularly in many public performances throughout the year, such as "Nuits d'Afrique", "Rhythme du monde", "Vues d'Afrique", the Montreal Jazz Festival and regular shows at clubs like Balattou. Among the many traditional instruments brought to Canada from these African countries is the kora. The kora is a 21-stringed, acoustic instrument, played somewhat like a harp. The body of the kora consists of half a large calabash gourd covered with cowhide and pierced through with a long wooden pole that acts as a neck and tailpiece. Kora strings are fitted by leather bands to this pole. Once made of twisted antelope or cow hide, kora strings today are nylon (usually fishing line) which are more durable and provide a brighter sound. A kora requires special attention to the type of strings, the quality of leather, and the quality of gourd. Koras are the instruments used by griots, hereditary professional singers, instrumentalists and verbal artists, who enjoyed the patronage of kings and have played an essential role in preserving oral histories and genealogies of their countries. A number of griots from Mali and other West African countries have settled in Quebec where their kora playing continues to develop in new directions. Almost 400,000 Caribbean immigrants are living in Canada, and the vast majority of them have come from the English speaking countries of Jamaica, Trinidad and Tobago, Barbados and Guyana. The largest communities may be found in Ontario, particularly in the cities of London, Toronto and Kingston. Caribbean music has a strong presence in Canada, especially in Toronto. The popular "Caribana" festival, one of many carnival celebrations held across Canada and currently the largest, draws an estimated one million visitors and residents each year. One of the most distinctive and well-known instrumental ensembles from a Caribbean country is the steel pan ensemble, from Trinidad. Associated with carnival in Trinidad, the steel pan also has been included recently in the elementary school curriculum in Toronto, an example of how instruments associated with specific countries and ethnic groups are moving into mainstream Canadian society. The instruments presented here are testimony to the long and varied history of immigration to Canada. As treasured artifacts, instruments and the music performed on them have served many important roles within immigrant communities, enabling immigrants to recall their cultural heritage (or, for the younger generations, to learn about it) reaffirming and/or negotiating cultural identity and communicating it to others, and reinforcing solidarity within the community. These instruments also may take on new roles outside of the immigrant community, as they move into mainstream Canadian or even global music culture. As vehicles for communication, musical instruments will continue to have social and cultural significance for all Canadian communities. 1 Sympathetic strings resonate along with the main strings, but are not played directly. 2 A "course" of strings represents two parallel strings played together that are usually tuned in octaves or in unison. 3 South Asia is comprised of the Asian countries south of the Himalayas, including Bangladesh, British Indian Ocean Territory, Bhutan, India, Maldives, Pakistan, and Sri Lanka. Bégin, Carmelle. (1992) Opus: The Making of Musical Instruments in Canada. Gatineau: Canadian Museum of Civilization. Bégin, Carmelle. (2001) Résonance: Musical Heritage of La Francophonie. Bégin, Carmelle and Pierre Crépeau. (1989) Dance! Roots, Ritual and Romance. Gatineau: Canadian Museum of Civilization. Brunvand, Jan Harold. (1974) Norwegian Settlers in Alberta. Mercury Series Canadian Centre for Folk Culture Studies, paper #8. Gatineau: Canadian Museum of Civilization. Gibbons, Roy, ed. The CCFCS Collection of Musical Instruments: Volume 1 Aerophones, Volume 2 Idiophones and Membranophones, Volume 3 Chordophones. National Museum of Man Mercury Series, Canadian Centre for Folk Culture Series, Papers # 43-45. (1982, 1983, 1984) Gatineau: Canadian Museum of Civilization. Hoe, Ban Seng. (1989) Beyond the Golden Mountain: Chinese Traditions in Canada. Gatineau: Canadian Museum of Civilization. Huang, Jinpei and Alan P. Thrasher. (1993) Cantonese Music Societies of Vancouver: a Social and Historical Survey, Canadian Folk Music Journal 21: 31-39. Kallman, Helmut, Gilles Potvin and Kenneth Winters, eds. (1992) Encyclopedia of Music in Canada. Toronto: University of Toronto Press. King, Patrick. (Director) (1999) Bagpipe: Instrument of War [Film]. London: Westminster King Productions. Klymasz, Robert. (1991) Art and Ethnicity: The Ukrainian Tradition in Canada. Gatineau: Canadian Museum of Civilization. Magocsi, Paul Robert. (1999) Encyclopedia of Canada's Peoples. Toronto: Published for the Multicultural History Society of Ontario by University of Toronto Press. Sadie, Stanley, and J. Tyrrell, ed. (2001) The New Grove Dictionary of Music and Musicians. London: Macmillan.